functioning of the body. Provide energy, antioxidant, heart, immunity, metabolism and overall health support. 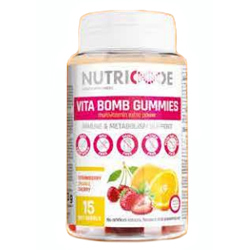 A vitamin bomb in the form of delicious gummies: • vitamin A (150% of the daily demand in 2 gummies*) supports eye health • E (446%) has antioxidant properties and as a result helps heart health and cardiovascular function • D (200%) important for bone health • C (75%) influences immunity • B6 (143%) and B12 (320%) support correct energy metabolism • folic acid (200%) takes care of the nervous system • biotin (300%) provides healthy hair and skin • pantothenic acid (167%) takes care of your mental capacity • zinc (50%) is beneficial for metabolism • iodine(53%) affects the proper functioning of the thyroid gland.